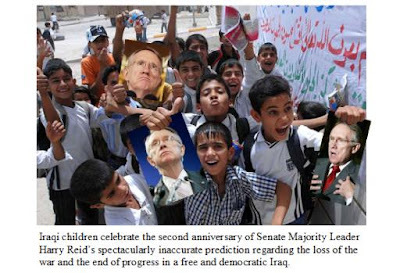 Two years after U.S. Senate Majority Leader Harry Reid declared the Iraq war "lost" and that “the surge is not accomplishing anything,” Iraqis celebrated the second anniversary of those wonderfully inept remarks. In neighborhoods that 84% of Iraqis now say are safe, huge crowds gathered to cheer the inspiring lack of foresight demonstrated by the leader of the U.S. Senate. As 64% of Iraqis now say democracy is the best form of government and reject an Islamic state, and 75% of Iraqis now support their own security forces, even higher percentages now say Senator Reid laid a really, really big one two years ago.